Had some fun yesterday playing with the “Menswear” set from Flourishes. I actually felt a little guilty cutting off perfectly good sleeves. You would have thought it was a real shirt that I was altering! Here is the card I made yesterday. 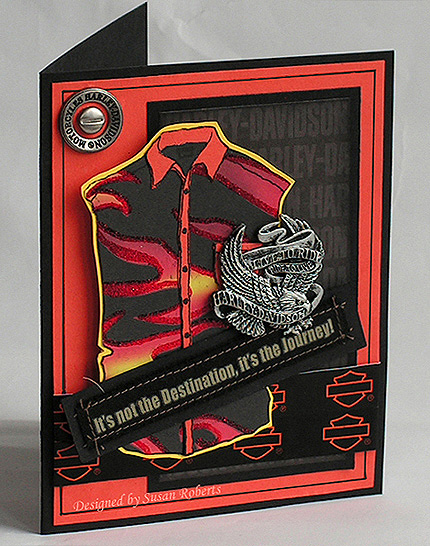 Oh my, I had to add a Harley symbol “leather” ribbon to cover up the goof. It made the bottom of the card too heavy. It felt unbalanced so I added the brad. I got the brad too close to the corner. Had to move it in which of course left a visible gaping hole. So I added the hardware ring. Now the top of the card was too heavy. So I added a second ribbon. Was this ever going to end!?! LOL Well for better or for worse I ended this journey! Do you ever have one of those kind of days? 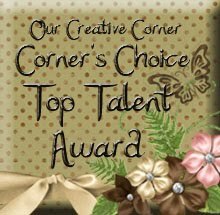 Before I go I wanted to share a scrapbook page that I did a couple of years ago. I originally started this hobby with the intent of scrapbooking. Well this was my first page. I’ve only done three pages since! The layout is a CASE of a page that I saw on display at Ben Franklin. 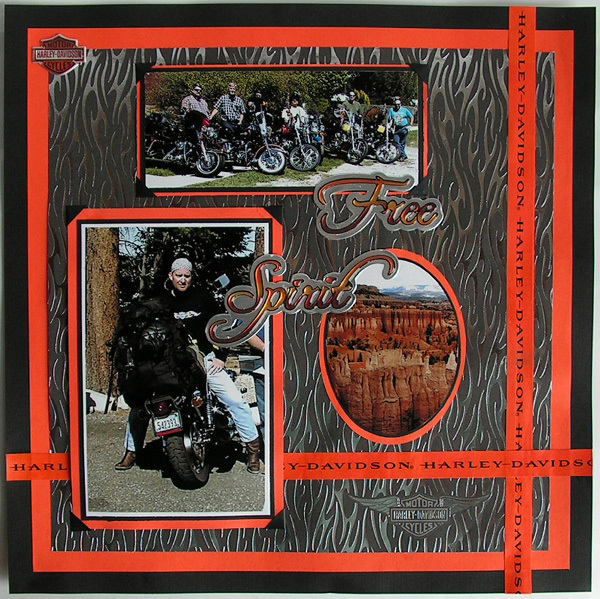 That’ my DH and his biker buddies on their ride to the Grand Canyon. Aren’t they adorable! Today, Sunday, September 21st, is World Alzheimer’s Day. Recently Carolyn King’s (Cammie) grandmother passed away from the effects of this devastating disease. 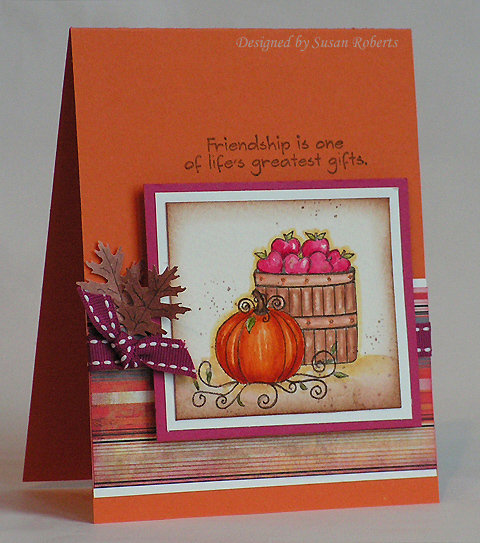 And now in remembrance of her grandmother, Carolyn has illustrated a stamp set called “Whimsical Autumn”. It has been released with Gina K. Designs. The remarkable thing here is that Carolyn is giving 100% of her proceeds from the sale of this stamp set to the Alzheimer’s Association in honor of her grandmother.. So with that in mind I just had to purchase this adorable set. Here is the card I made with it. 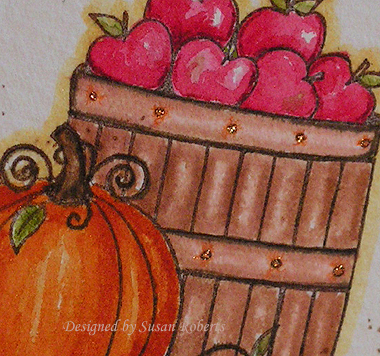 I first stamped the pumpkin image, masked it and then stamped the basket of apples. The images have been painted using reinkers. The Flourishes Design Team as well as the Friends of Flourishes Designers have come together to support Carolyn in this effort. 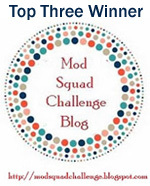 We have all purchased the set and are sharing our work today on our blogs. Check them out and see what everyone has done. 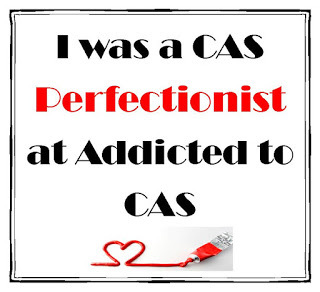 And, if you can, purchase Carolyn’s set, too, to further help in the cause. 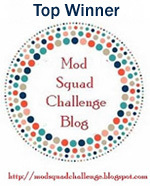 Oh and one other thing.. Be sure to stop by Carolyn’s blog today. 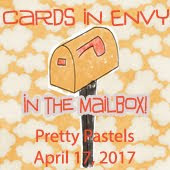 She has one of the biggest ever blog candy giveaways worth over $1000!! And it’s all in honor of World Alzheimer’s Day. 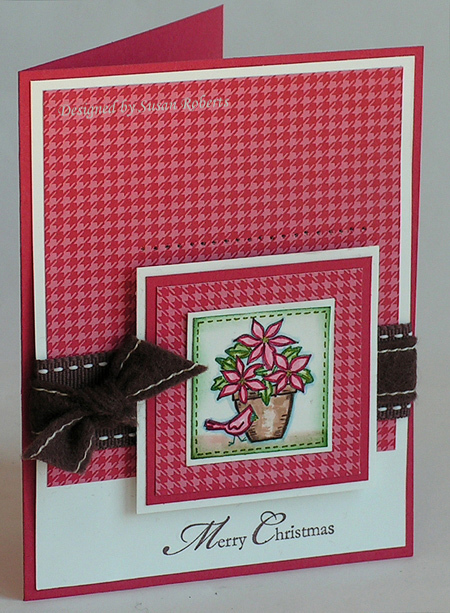 When I saw this challenge for a NO LAYERS card over on Splitcoaststampers, my first thought was clean, simple, elegant. Right? Well… no. It didn’t happen that way at all. Sometimes I seriously wonder what is wrong with me. Maybe it was the fact that it was a “dirty” challenge that this card ended up being so messy? But in any case I think I followed all the rules and restrictions. At least I didn’t see it stated anywhere in the challenge that the card had to be “clean” (even if that was the intent!). 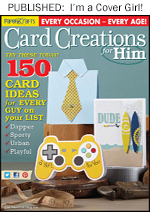 The card base is the only card stock used. 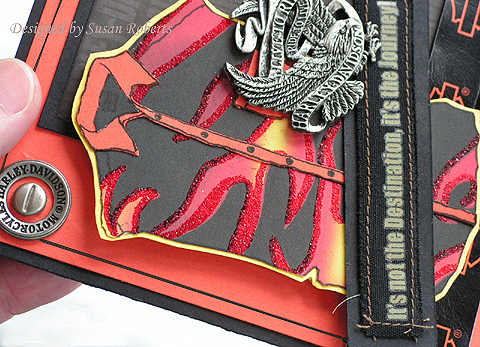 I did do some embossing across the bottom of it and also on the inside. 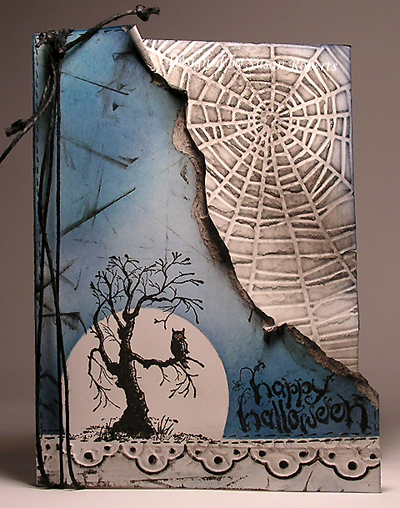 I tore off a lot of the front of the card to expose the spiderweb embossing. And there was some masking done across the bottom and for the moon. I sponged on all the blues. Hey I guess the bottom line is I did have fun! *chuckle* If you want to see what the other Dirty Girls and Alumni did with this challenge you can check out the DCNL908 SCS gallery here. 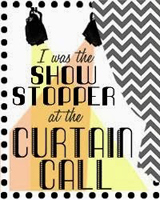 I so love Michelle Zindorf’s style. She makes the most unique and stunning cards. So for my card today I decided to try following one of her many fantastic tutorials. The one I chose can be found here. I changed (or should I say omitted) some steps to make it more beginner friendly! lol Thank you, Michelle! I used a tree image from one of Flourishes most recently released sets, “Forest of Trees”. I also used Flourishes “Flourished Elements” and “Flourished Words” sets. That yummy ribbon is by May Arts. And finally I just had to post a close-up-taken-in-the-sunlight picture of the Flower Soft product that can be purchased at Flourishes. This stuff is so cool and adds so much texture and interest. Plus it’s so easy to use. (But be sure to turn off all fans before opening up the package. It’s really light and fluffy.) 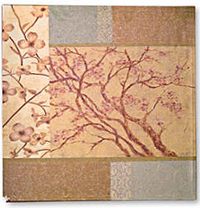 Nancy Kirk, one of Flourishes owners, has made a video demonstrating this product. Yay!! Yesterday I got to play with my new Stampin’ Up! toys. What fun I had. 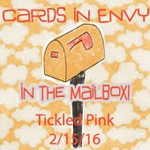 *big grin* I was able to make three cards all of which are SUO (Stampin’ Up! Only). 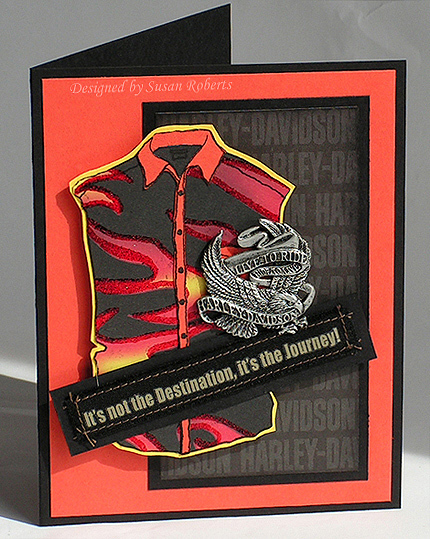 The first card was made for Beate’s Inspiration Challenge #23. This room was the inspiration piece. And here is the card that I made for it. 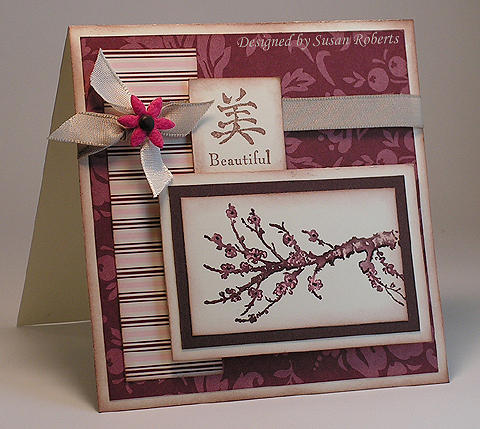 I used two of my new stamp sets, “Nature Silhouettes” and “On Your Birthday”. I also used some of SU!’s new Designer Series Paper “Manchester”. Now I couldn’t wait to use my new “Alpine” Ribbon Originals. 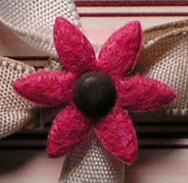 Oh don’t you just love this chocolate chip felt ribbon complete with stitching. 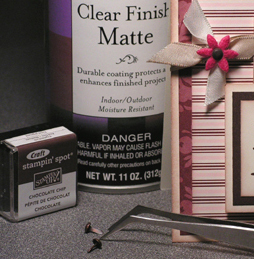 I combined it with the new 1″ wide chocolate chip grosgrain ribbon. Two more new sets, “A Flower for All Seasons” and the beautiful Merry Christmas sentiment from “A Cardinal Christmas” were used. 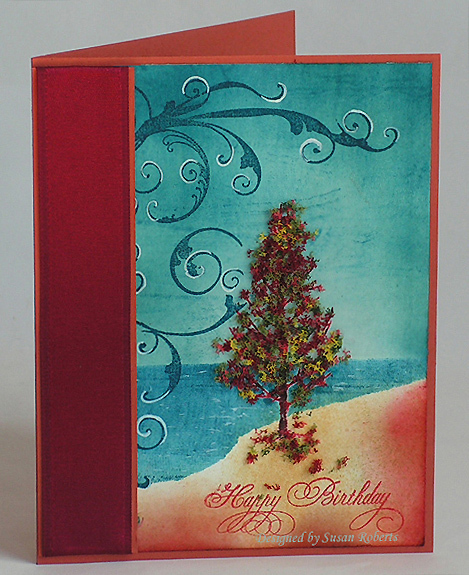 “Holiday Treasures” is some of the most beautiful designer paper… EVER!! Yup I used some of that, too. The third card today uses the new set “Starring You”. 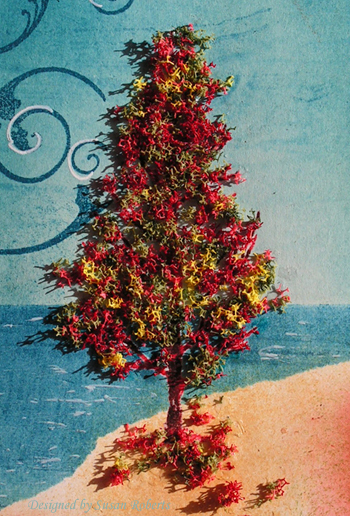 This card is made with the new In Color “Baja Breeze”. Wow I love this color! 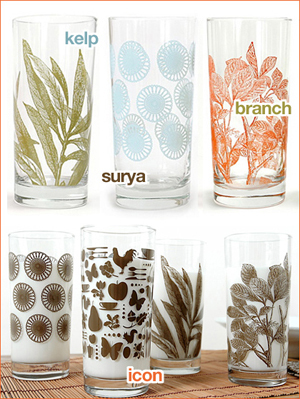 The designer paper is the new “Patterns”. The new 1-3/4″ circle punch was used for the black circle behind the main image/sentiment. The stars were stamped with SU!’s “Classic Backgrounds”. Although this is not a new set, it was the first time I have used it. 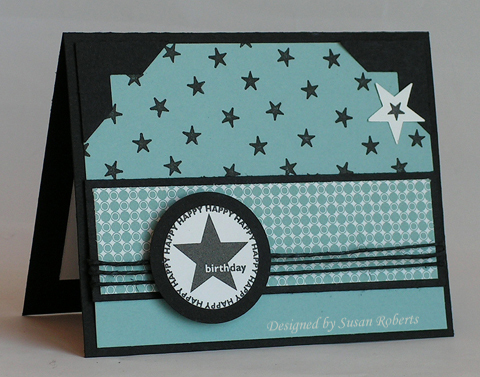 To make the little star embellishment I stamped a single star on some whisper white card stock. Then I took the small star punch, centered the stamped star and punched it out. Oh yay! It was a fun day!! Hope you get some stamping time in, too!! 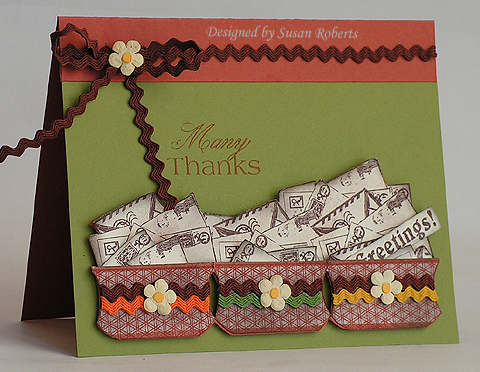 Here is a card using Flourishes newly released set “Mixed Greetings”. 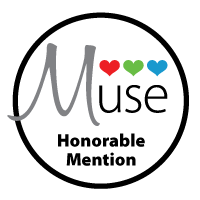 Huge congratulations to Leslie Miller for coming up with the wonderful concept for this set! It’s SO versatile!! To get my huge pile of envelopes I stamped the envelopes image several times at slightly different angles and used some Eclipse masking tape here and there. It was then cut out. I stamped the basket image three times, cut them out and then applied the ric-rac, a prima and a tiny dot of Summer Sun card stock to each of them. The baskets were popped up on dimensionals. The pile of envelopes and the greetings sentiment were then tucked inside and also popped up with dimensionals. The main sentiment is from Flourishes “Many Sentiments”. What fun this was and so quick and easy. Here are the three sets released this week at Flourishes. 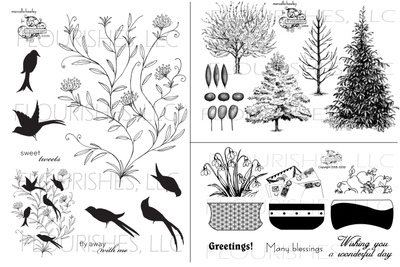 And just one last reminder about Flourishes “New Release Bundle” deal. You can purchase all the new sets for 10% off! This offer is good through September 17th. The three new sets this month are “Birds and Vine”, “Forest of Trees” and “Mixed Greetings”. 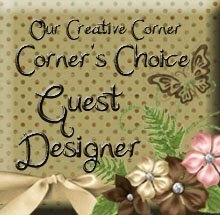 Also if you want to see more cards made with this week’s new releases, be sure to visit the other Flourishes design team member’s blogs. 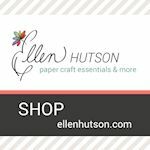 In yesterday’s post I talked about the Vellum Glue Dots that weren’t really “dots” at all but rather sheets of adhesive that you transfer to an object that you want to adhere. Well I had a few questions about it. So rather than try to explain it further, I decided that a picture was worth a thousand words. So here is a picture of a sheet. You can see the area of “sticky”. You just place the sheet on an object (like acetate) and rub the back of it, and the sticky transfers over to that object. Now on yesterday’s card you really could not see the adhesive at all. 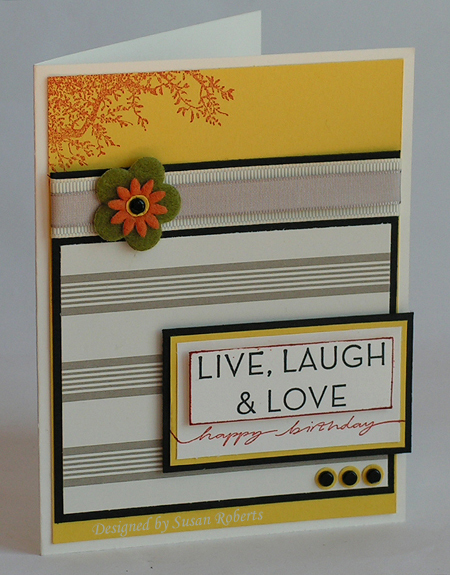 However I did another card using the clear card stock that had a plain Very Vanilla background. The adhesive is slightly visible, but still does not look too bad. Here is the card I made. I used an orchid that my son’s girlfriend grew and dried and then gave to me. This past week I learned that a very dear friend just lost her mother to Alzheimer’s. 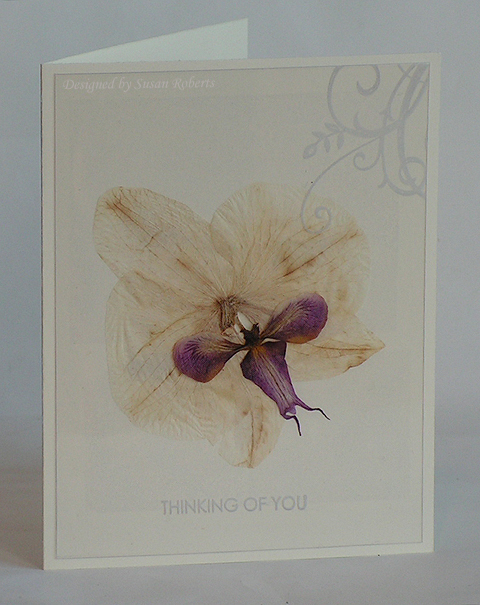 This card is for her as I truly have been thinking of her, her dad and her whole family so much this week. I know I’ve mentioned this a lot before, but I love Fridays! My youngest son’s 17th birthday is tomorrow. We may have something a little rowdy planned! lol The ONLY thing he wanted for his birthday was tickets to the “Gymnastics Superstars” at the Tacoma Dome later this month. He has a total crush on that little darling Shawn Johnson and isn’t afraid to admit it! *chuckle* Well together we searched Ticketmaster and Ebay and couldn’t find any good seats. And then a few days ago, on a whim, I checked Ticketmaster again totally not expecting to find anything. BUT… woohoo… I got him two tickets… 5th row… smack dab in the middle of the center section!! It may be the 5th row but he is going to be in 7th heaven!! Don’t you just love it when things like that happen! Hope everyone has a happy and fun weekend. 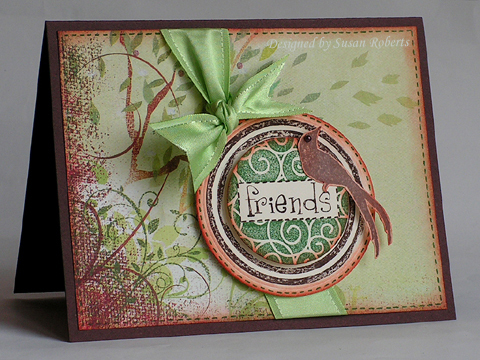 Today’s card is stamped with another new release from Flourishes called “Forest of Trees”. To make this card I tore a strip of Eclipse masking tape and covered the lower half of the whisper white card stock. Then I sponged the top half of the card with Bashful Blue, Ballet Blue, Almost Amethyst and Sage Shadow. Once sponged I removed the masking tape and stamped a sentiment from Flourishes “Peace” set and one of the new tree images from “Forest of Trees” several times with Versafine “Onyx Black” ink. This image was then adhered to the black card base. 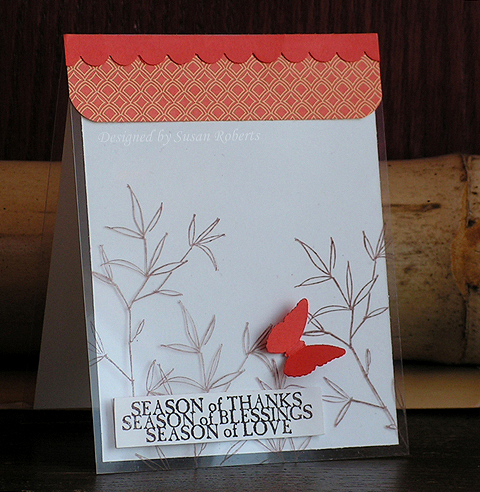 I then embossed the Crystal Clear Card Stock (acetate) using a Cuttlebug and the Swiss Dot embossing folder. 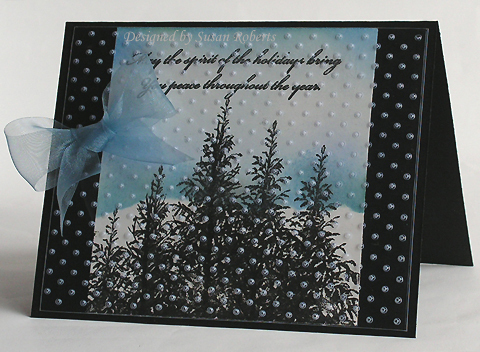 I used Vellum Glue Dots to adhere the acetate to the front of the card. 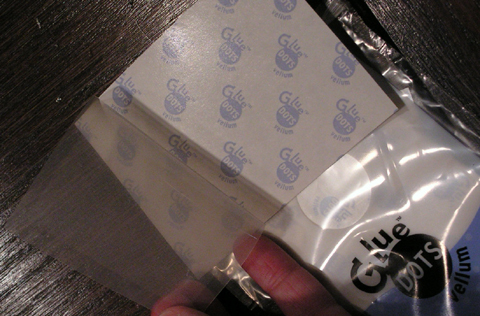 (The vellum glue “dots” are actually not dots at all but are an adhesive in a sheet form that you simply transfer from the sheet to the object you want to adhere.) Lastly a bow using May Arts ribbon was added. Oh and just a reminder about Flourishes “New Release Bundle” deal. You can purchase all the new sets for 10% off! This offer is good through September 17th. The three new sets this month are “Birds and Vine”, “Forest of Trees” and “Mixed Greetings”. Also if you want to see more cards made with this week’s new releases, be sure to visit the other Flourishes design team member’s blogs.